Throw out your vintage effects, this mic does it better. 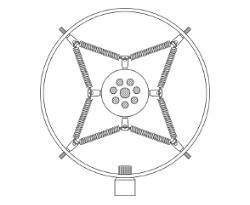 You can find Placid Audio products on Vocal Gear Store. Most of the time in either a live or studio situati on when I'm looking to give a vocal track a bit more of a distinctive sound I instinctively either reach for some flavor of an effects processor or my favorite plugin. Why? Because generally unless one enjoys combing through Craigslist and eBay listings for that perfectly elusive esoteric microphone, modern effects processors with hundreds if not thousands of available models to choose from often sound quite good in addition to offering nearly infinite control over our sound. Convenience, however comes at a price and there is one effect situation in my experience where the cold unfeeling electronics continually seem come up a bit short of something authentic sounding: the vintage "telephone" effect. Sometimes there's no replacement for the real thing and thanks to Mark Pirro of Placid Audio we have something called the Copperphone Mini that may just fill that niche. Placid Audio was initially spurred by a need of the singer of Pirro's band - The Polyphonic Spree - to find the perfect vintage sounding microphone. Instead of trying to actually find something authentically old Mark - whom is also a sound engineer - decided to have a crack at creating his own. After creating a few prototypes, word started to spread around the musician community and in 2003 Pirro started producing small quantities in his garage outside of Dallas, Texas to fill the need. 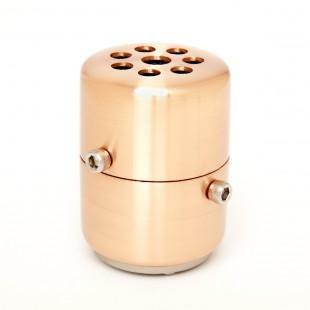 As popularity grew he created two additional models, one of which is the Copperphone Mini . One of the most distinctive features about the Copperphone series is Placid Audio builds them out of rather robust looking polished copper housings. 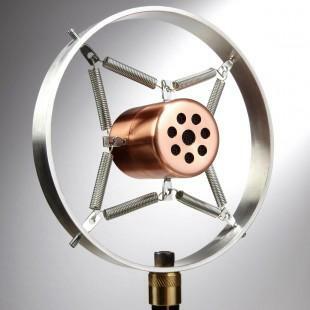 The Copperphone mini is no exception and is rather attractive to look at especially when installed it is removable aluminum shock mount housing. Construction and fit and finish is high grade and I would say the overall look belies its $299.00 MSRP. Oddly enough the Copperphone Mini was originally designed with Harmonica players in mind but after artists started using it on vocals, guitars, upright basses and the like it became apparent that the point of the Mini isn't the application but rather the creativity it can introduce into the sound. The Copperphone Mini uses a fairly forgiving dynamic as well as a cardioid pickup pattern to make it fairly versatile both live and in studio. Contrary to the look the Mini does not use any vintage internal components but rather high-grade modern electronics with an impressively low noise floor. It should be noted that any mic or effects box operating in a limited frequency bandwidth can increase the potential for feedback depending on how much gain you are trying to pump through it. However, in practice I didn't find the Mini to be any better or worse compared to other similar devices when pushed beyond realistic limitations. So then how does the Copperphone Mini sound? Impressive. On vocals, the Mini finds an excellent balance between that vintage lo-fi effect and leaving a wide enough of a frequency band so the vocals still have some weight to cut through the mix. The Mini when compared to some telephone effects I had in my signal chain really shined with its warm analog goodness. I found the Mini to inspire more creativity than just a stock telephone effect as I felt generally it had a much more authentic sound and that could even be varied by careful use of proximity effect.